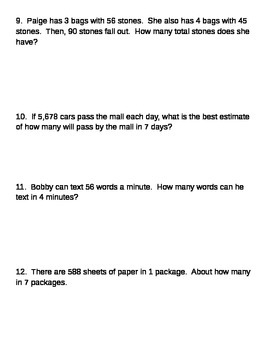 This is a great multiplication review packet (4 pages, 12 total problems) for single digit multiplication. Topics include: estimating, word problems with single digit multiplication, multi-step word problems, and multiplication comparisons.) 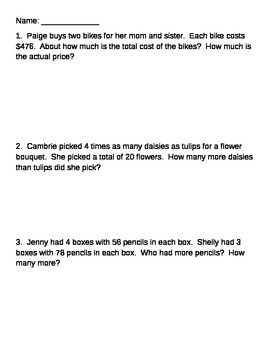 Each page has three to four problems, allowing enough room for students to show their work. 2) 2. Cambrie picked 4 times as many daisies as tulips for a flower bouquet. She picked a total of 20 flowers. How many more daisies than tulips did she pick? 3) Jenny had 4 boxes with 56 pencils in each box. Shelly had 3 boxes with 78 pencils in each box. Who had more pencils? How many more? 4) There are two sections of a movie theatre that has every seat filled. The first section has 8 rows with 13 seats in each row. The second section has 12 rows with 5 seats in each row. How many people are seated in this theatre? 7) For the months of June, July, and August, Holly collected 2000 stickers each month. For the next two months, she collected 3000 stickers each month. How many total stickers did she collect between June and October?